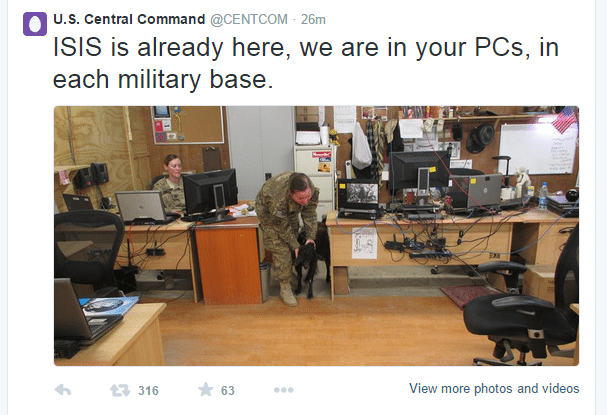 Breaking News is coming from the twitter that the twitter account of the U.S. Central Command has been hacked just few moments ago, and it is tweeting threatening tweets to the US soldiers. In the name of Allah, the Most Gracious, the Most Merciful, the CyberCaliphate under the auspices of ISIS continues its CyberJihad. While the US and its satellites kill our brothers in Syria, Iraq and Afghanistan we broke into your networks and personal devices and know everything about you. Facebook page is safe right now, as we checked for it at the time of updating this. We are updating this story, after getting more information about the hacks, as many of the tweets also show that Internal data also leaked: tweets indicate.